I’ve been wanting to start a video series called “How To Do Anything Better”, but have put it off for various reasons like: fearful of how I look and the quality of the production. Until now. I’ve decided to move forward with this series, regardless of my concerns. I decided that sharing helpful info is more important than my silly concerns. 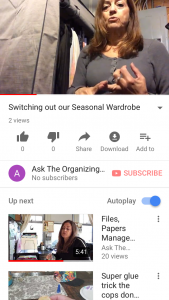 You can watch a video below on tips on how to switch out your wardrobe. I’m starting a series of quick videos on how to do anything better. Today’s episode covers some tips on Switching out our Seasonal Wardrobe. Yes, it’s in my basement. Hope these tips help you with your wardrobe switch over. t But let me know if you need help with project. We provide you with the know-how, tools and strategies to help create an organized and beautiful space throughout your home. Learn more about our services and solutions.